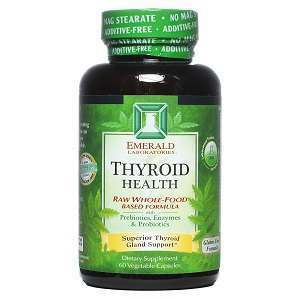 This is a review of Emerald Labs’ Thyroid Health. The company making this supplement states that it helps the thyroid sustain its normal function and maintain the balance of triiodothyronine, one of two main hormones produced by the thyroid. Read on to learn about its ingredients and our opinion of whether this is the right product to take for your health supplement needs. Continue reading this review if you wish to find out what are the ingredients making this supplement and whether it will satisfy your individual needs. Both Iodine and Selenium are components required by the thyroid to produce the hormone and maintain its health. Without Selenium the body cannot recycle Iodine, leading to further complications of the condition. The raw whole-food proprietary blend is made from food sprout powders, raw plant enzymes, raw probiotic blend, Goji fruit extract, etc. It also has pomegranate juice powder, and pomegranate is known to have a poor interaction with a number medications, namely decreasing the speed and subsequently prolonging the time needed by the body to break down certain drugs such as those processed by the liver and high blood pressure medications. The capsule is made using vegetables and plant material, making it vegetarian friendly. Daily recommendation for this supplement is two capsules on an empty stomach. You can take both in the morning, or split them up and take one before breakfast and one before dinner or sleep. The Selenium content is 285% of the daily value, so make sure you check with your doctor before adding this supplement into your daily diet. The supplement is not being sold on the company’s website, but rather via retailers. One of them is offering the supplement at a lowered price, the original was $34.95 and now $26.21, a 25% savings. Out of the three retailers offering this product, two of them offer no guarantees, and the third offers you to exchange the returned product for a new one or get store credit. You can do this within 30 days of the purchase and only with a receipt. This “no concrete guarantee” policy and exchange of the product for a new one might me happening due to the company only having a small margin of profit, but if they intent to sell a well-built product, a proper guarantee is a must. Unfortunately, there were no reviews for this particular supplement, probably because there was no reviews section on the retailer’s website. Thyroid Health can be considered a good product, with all the necessary vitamins and mineral needed for your thyroid’s well-being. The price is a strong selling point, with a 25% discount, making it cheaper than other similar products out there. The main problem here is a flimsy or no guarantee policy, the other products might be more expensive, but many of them are actually user oriented and come with a proper guarantee. The pomegranate juice powder is known to interact with other medications, so stay clear of it if you are taking therapy that is decomposed by the liver, or that for high blood pressure. Lauren Shepherdson	reviewed Emerald Labs Thyroid Health	on August 12th	 and gave it a rating of 2.